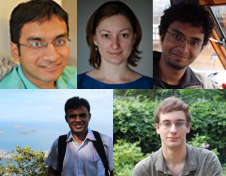 The Siebel Scholars Foundation has named five Carnegie Mellon University graduate students — Jason Richard Koenig, Anuj Kumar, Gabriela Marcu, Ishan Misra, Mrinmaya Sachan — to the 2014 class of Siebel Scholars. The Siebel Scholars program recognizes the most talented students at the world's leading graduate schools of business, bioengineering, and computer science. They are chosen based on outstanding academic achievement and demonstrated leadership. On average, Siebel Scholars rank in the top 5% of their class, many within the top 1%. Each receives a $35,000 award for their final year of study. Koenig, who earned a bachelors degree in computer science at CMU, is pursuing a fifth-year masters degree. His research interests are formal verification, static analysis techniques, and formal methods. He has focused on static analysis for C0, a subset of the C programming language targeted at introductory programming courses. In spring 2013, he interned at Johns Hopkins Applied Physics Laboratory, where he developed a tool for analyzing embedded flight software. In 2013, he received an Honorable Mention in the CRA's Outstanding Undergraduate Researcher Award. Kumar is a Ph.D. student in the Human Computer Interaction Institute (HCII), where he received his masters degree. His research focuses on developing speech-user interfaces for millions of atypical users, such as children, low-literate users, or speakers of minority languages. His work bridges the gap between speech recognition technologists and human-computer interaction designers to enable rapid development of speech interfaces. He has collaborated with industry groups at Microsoft and IBM, and university groups at U.C. Berkeley and IIIT Hyderabad. Two of his papers were nominated for best paper awards at CHI, the premier human-computer interaction conference. His research has been featured in international media, including ABC News and a CBC documentary. Marcu also is a PhD candidate in HCII. Her research spans ubiquitous computing, applied sociology, and mental health. She uses action research to study and affect the intersecting roles of ubiquitous technology and face-to-face collaboration in the context of mental health services. She has designed a system that uses a network of tablet devices to enhance evidence-based clinical practice by supporting the collaboration of various stakeholders around patients' behavioral data. Her dissertation work involves studying the impact of this system on the social interactions of real stakeholders, to learn how mobile systems can improve mental health services by encouraging more face-to-face collaboration. Ishan is a masters student in the Robotics Institute with a particular interest in computer vision. His research is rooted in object detection and scene understanding. Over the past year he has worked on algorithmic and systems aspects for making object detection practical for applications such as first person vision (FPV), cloudlets etc. He is working on using data-driven methods to discover discriminative variations in real world objects. The hope is to learn good object detectors without use of heuristics and human intervention. Such systems can be used by robots when encountering unknown objects on the field. Sachan, a masters student in the Language Technologies Institute, seeks a deeper understanding of social networks and the flow of textual information through them. Social networks with several modes of communication and diverse interaction types provide a rich source of heterogeneous data, which can be exploited to discover previously unknown interests and relationships among people. Sachan has presented several papers at major web and natural language processing conferences.